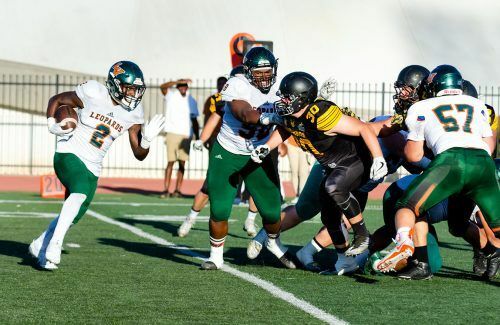 The La Verne Leopards took on the Zorros of Centro de Enseñanza Técnica y Superior University, or CETYS, Saturday. The Leopards finished victorious with the final score of 44-12. “I think it’s just a cool experience to be able to play with guys that want to spread the culture of football internationally,” said ULV’s junior linebacker Conner Johnson. The game started with the Zorros throwing an interception to junior cornerback Mason Thomas, who set up great field position at the CETYS 22-yard line for senior quarterback Josh Evans and the Leopards to operate in. “Going into this game we felt we had a lot to prove coming back from last week’s loss,” said sophomore linebacker Gabriel Lopez. Evans rushed it up the middle for 11 yards to set up first and goal for the Leopards. Evans then completed a short pass to freshman receiver Arturo Herrera-Caballero for the score. A missed point after meant the Leopards were up, 6-0. The Zorros did not back down easily and responded with a touchdown of their own. “We just need to be more consistent with our passing, our blocking, our everything,” Holliday said. Starting from the Zorros’ own 3-yard line, CETYS tight end Carlos Gonzales kept their drive alive by pulling down a 39-yard reception before being tackled at the ULV 23-yard line. CETYS receiver Jesus Ambriz got CETYS tied with La Verne after a failed two-point conversion. The score was 6-6 going into the second quarter. During a CETYS drive that looked threatening, junior cornerback Jordan Peevy relieved the Leopard defense with an interception after the Zorros quarterback Barak threw a long ball on third and 15. The resulting drive saw a 63-yard breakaway rush by senior running back Martaveous Holliday and setting up first and goal for the Leopards. La Verne senior running back James Gonsalves took it in from 5 yards to put the Leopards back on top, 13-6. The Zorros’ next possession did not last long as senior cornerback Derrin Hooks intercepted a pass over the middle and took it 66 yards for the score to extend the Leopards’ lead to 30-6. The third quarter began with a Leopards trick play. After a holding call on first down for the Leopards, a 5-yard carry and an 5-yard pass completion was not enough for the first down. On fourth and 10, ULV attempted a fake punt with senior running back Marcellus Hunter being stopped by the Zorros special teams. But Hunter and Holliday bounced back to lead the show and the Leopards’ game only grew from there. While the La Verne defense were able to find a rhythm to counter CETYS, the Zorros still had fight within them. Late in the fourth quarter, the Zorros’ passing game peaked and the visitors drove down from their own 20-yard line. The resulting drive ended with a beautiful 34-yard pass and one last scoring play for the evening. The exhibition win gives the Leopards momentum going into Saturdays match-up with Puget Sound at 1 p.m. at Ortmayer Stadium. “It definitely helps us because there’s a lot of learning moments in there,” running backs coach Vincent Hebble said. Andrew Alonzo can be reached at andrew.alonzo@laverne.edu.